The first record of inhabitants in Weare (then known as Beverly-Canada) dates back to 1735 with the presence of Col. Robert Hale, of Beverly, Massachusetts. Hale petitioned the province of Massachusetts to create a township six miles square to be given to soldiers and their families. During this same time period, the name of the town was changed to Halestown. The town name was changed to Robiestown in 1740 after the new leader of the town’s proprietors, Ichabod Robie was granted control. In 1748, the town name was changed again to Weares Town. In 1764, King George III named the town Weare, after Meschech Weare, the first governor of New Hampshire. In 1831, Moses Sawyer created the Weare Woolen Mills, which helped aid the railroad extension from Manchester through Goffstown, Weare, and into Henniker. The implementation of railway transportation significantly aided the development of many early industries. A defining moment that changed the face of the town came in 1938 when a hurricane sent gale force winds and heavy rains into the region. The vast amounts of water collapsed the Weare Dam, causing a massive flood that engulfed a large section of the town. Piscataquog River Mill Sites Marker memorializes the mills located in Weare along the Piscataquog River, many of which were destroyed in 1938 by the severe hurricane and flood. These mills were the economic life-blood of the town for over 200 years. The mills provided employment, goods and services, manufactured textiles, toys, wood and metal products and even shoes. Several factors contributed to the decline of these mill sites including fire, floods, and growth of new industry in the City of Manchester. The only mill still in existence in the 21st century is the Amos Chase Mill, which is on the National Historic Register. Weare Congregational Church was built in 1841 and used over the century as a Baptist church, Congregational church and is presently a Federated church. In 1921, Quakers and Congregationalists formed the Weare Federated Church, which was amicably dissolved in 1994. Weare Town Hall, built in 1837, is on the National Register of Historic Places. Originally town meetings were held on the first floor and the Universalist Church met on the second floor. In 1919 the first Public High School Classes were offered on the top floor of the Weare Town Hall. Stone Memorial Building in Weare town center is the home of Weare Historical Society. 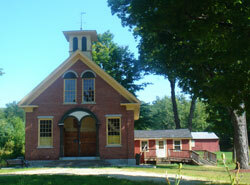 Originally the 1836 building was constructed to house an office for the selectmen, a library and a veteran’s memorial. Today it houses Weare artifacts and memorabilia along with items for sale, including 1888 and 1892 maps, reprints of Weare's histories, and several other publications. This building is eligible to be listed in the National Register of Historic Places. Paige Memorial Library (at left) constructed with money left by Eben L. Paige, the library was dedicated in 1927 and remains in use today as a part of the expanded Weare Public Library. 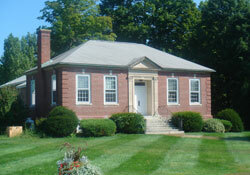 Weare first established a free library in 1892 in compliance with state statutes passed the previous year. The book collection outgrew several locations, finally arriving at a building on East Road in Weare Center, prior to the Paige Memorial Library being built. Amos Chase Home is a large white house, owned by Amos Chase in the mid to late 1800s. In back of the house is the Amos Chase Shop which was built in 1836 and used as a carriage manufacturing site until 1844. The building was burned in 1844 but was re-built in 1850. Moses Currier made screw plates, augers, and tools here from 1850-1870. The first tavern keeper at Maplewood Tavern (at left) in Tavern Village was William Dustin, who served under General Star at the Battle of Bennington. Also known as the Dearborn Tavern, it is located on Dustin Tavern Road and is one of many historic residences in Weare. The original building was known as the “Dustin Tavern” but was burned and rebuilt in the 1880’s. The second floor of the building was laid on springs to make it suitable for dancing. 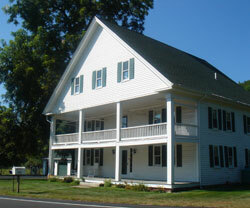 John Dearborn Residence, located on NH 77, is one of many historical homes located in Weare. Also known as the Riverside Academy, North Weare Schoolhouse (at left) was constructed in 1855 and was in use as a school as late as 1952. Located on Concord Stage Road, the building was later owned by Hales Town Grange and is currently privately owned. Also known as “Stubby’s Store”, Weare Center Store burned in 1891 only to be re-built the following year. The building, which is located on South Stark Highway, was used as a post office from 1813 until the 1940s. Scenic views northbound and southbound on Route 77 include the coniferous forests that characterize the region. Weare Stream Meander is the scenic view of the Piscataquog River along Route 77 near the Congregational church on the John Stark Highway. 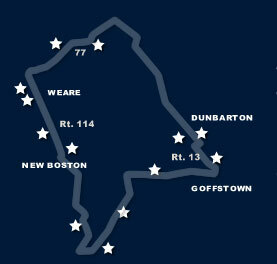 Continue south on Route 77 to New Boston.